Below you can see an example of the right and wrong way to connect your line. The line on the right is perceived as smoother, you can more easily see the curve in it. The one on the right is pointy and blocky. 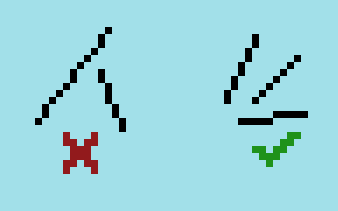 You’ll see later how much a single corner pixel can change the shape of a line. It’s common to draw a line in a messy fashion, where it may look like the line on the left, and then clean it up after by zooming in and removing some of the corners. When pixelling straight diagonal lines, there’s one simple rule to follow: it should be made up of identical line segments. In other words, the line should actually be made up of a bunch of smaller lines that are the same length. You can see below the lines on the right appear straighter. Our eyes easily notice when one segment is different from the others in a line, it sticks out and looks bumpy. This can be a hard rule to work within, and you may have to alter your piece to make it work, but not doing this creates jaggy looking lines that don’t accurately depict what you’re trying to show. Break this rule only when you have to. Drawing curves follows a similar theory to drawing diagonal lines. This will let you draw circles that look perfectly round, and not bumpy. The easiest place to start is cirlcles. Like in straight lines, you’ll have to pay attention to the length of each line segment. Instead of making them all identical though, you will put the biggest ones on the top, bottom, left and right of the circle, and they will gradually get smaller towards the middle. 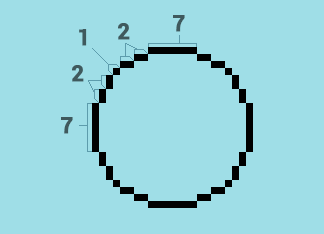 You can see in this example, the line segments on the top of this circle are the longest (7 pixels), and then 2 pixels, and then 1 pixel in the middle. Here’s a counter example, the lengths go 5, 2, 1, 2, 1 (left), but instead should go 5, 2, 2, 1, 1 (right). You can see not doing this gives the line a little lump in the middle. Unfortunately, most graphics programs will draw circles the wrong way, because technically it’s more correct mathematically. But who cares about math, right? We’re artists, our job is to make it look good. 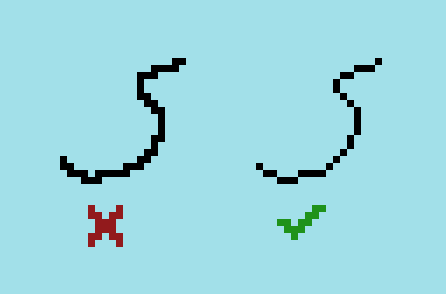 Once you get used to pixelling circles, you should be able to apply this to any curved lines in your piece. Outlines have the power to change the shape of your object, especially on corners. On corners, you can break the rule about only connecting diagonally in order to create a point. Check out how just changing the corner on this shape controls how it looks. This is something you have to keep in mind while outlining. Not every part of your object needs to have an outline. One common technique is to only put an outline on the outside of your object. This lets your object maintain contrast with the background, but can save space and increase clarity of the details within. You can see that an outline is not always needed, for example you can still clearly see the hair and head are separate objects, even though there’s no line. But in some places where there isn’t enough contrast (or possibly none), you’ll still have to add a line, such as between the head and neck. Another common place to forego outlines is where your object touches another. The most common place this is used is the bottom of an object that’s resting on the ground. Here on this character there is no outline where her hand is touching the stick she is holding, or on the bottom of her feet. Not doing this can sometimes make the object feel like it is floating and not actually touching the ground / other object. This suggests to the viewer that there is definitely separation between these two objects (such as the hair and head), but without filling all that space with black lines. You just need to draw enough of the line to suggest the separation. 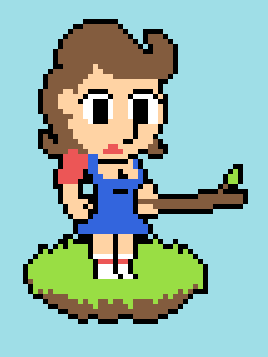 Like in all aspects of pixel art, you don’t need to draw everything, just enough so the viewer gets the idea. 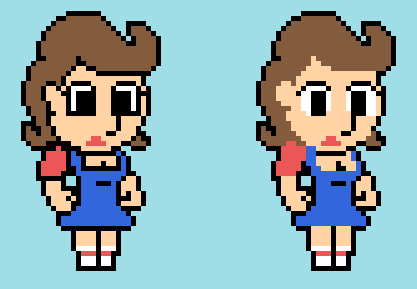 You can use all of this in varying degrees, it ultimately depends on the sprite, the background, the palette, and your personal taste. Notice how I tweaked the shape a little to better fit the outline. 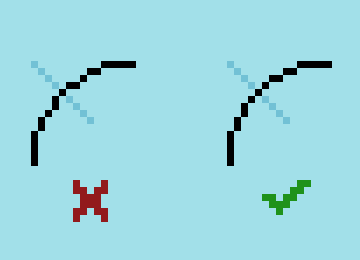 I hope you know understand how to draw clean, smooth outlines in pixel art. Follow my Twitter or Tumblr to hear when new tutorials get released.